An IRP 72-Hour Trip Permit is issued in lieu of IRP plates for travel within Michigan.This permit allows both inter or intra State movement in Michigan. That has a gross or registered weight that exceeds 26,000 lbs. 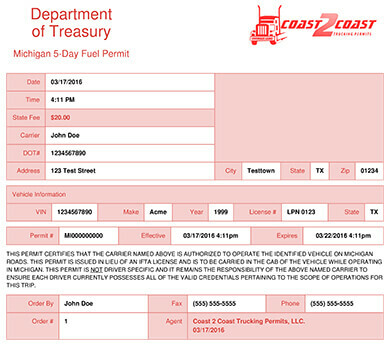 A Temporary Fuel Permit is issued in lieu of IFTA licensing for travel within Michigan. No more than 3 permits can be obtained per calendar year. And for vehicles with a gross or registered weight that exceeds 26,000 lbs.